Designed to last a lifetime, these cars will be hand-built at a 500 a year rate – chassis in the U.S.. body in Italy. Seven models include two sedans, two sports cars, coupe, convertible, and limousine. 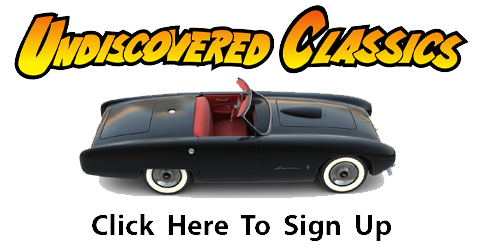 We’ve gathered quite a bit of information on the design, history, and disposition of this car, and today’s story here at Forgotten Fiberglass is the first “salvo” of many stories we will share about the “Argonaut.” It turns out the history of this car was far more interesting and complicated than the few stories that survive to this day on the internet or in books. 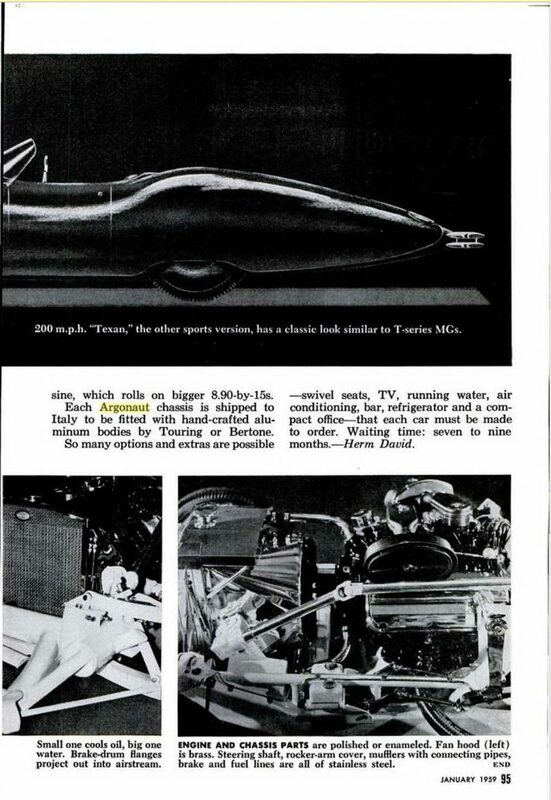 Seven models, sports car to limosine ($22,700 to $26,993). The Argonaut’s V-8 is a modified Chrysler marine engine. Horsepower is a secret – to enhance the car’s “dignity.” But it’s described as the most powerful ever mounted in a passenger car. Two 12-volt batteries are connected to a high-output generator that balances full load at idling speed. Aircraft wiring is used throughout. Two electric fuel pumps supply dual carburetors from a 32 gallon tank. Transmission options include automatic or manual with overdrive. Chassis come with a 154” wheelbase for the “state limousine,” 126 and ½ inches for other models. Frame members are five inch diameter cold-drawn seamless steel tubing with a 3/16 inch wall thickness. 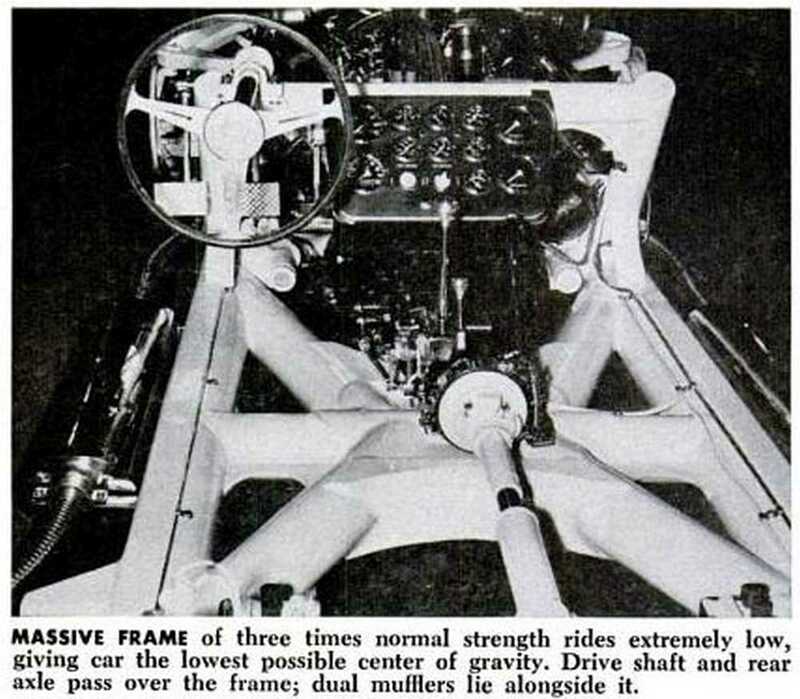 Front-end suspension is by torsion bars, with low-frequency semi-elliptic springs in the rear. Front and rear shock absorbers are individually adjustable from the dash. Extra-large brake drums have brake linings of sintered iron. Twin-stage master brake cylinders give the effect of power brakes, without a power assist. 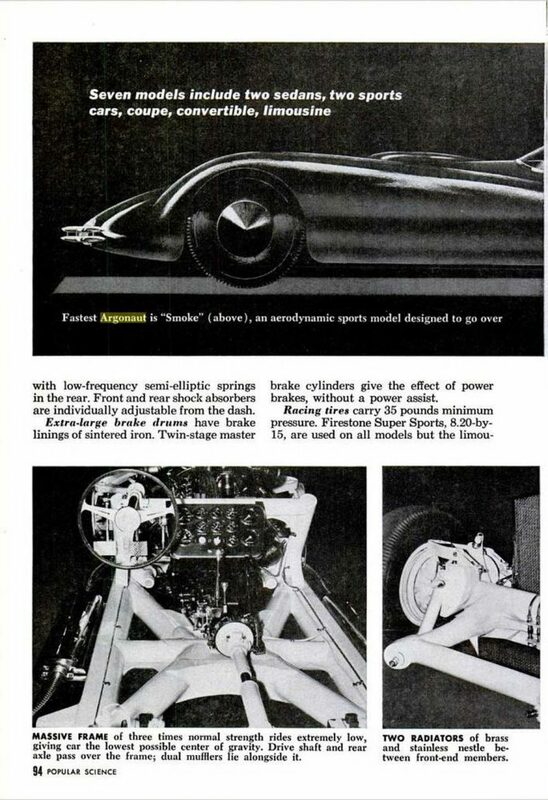 Racing tires carry 35 pounds minimum pressure. Firestone Super Sports, 8.20 by 15, are used on all models but the limousine, which rolls on bigger 8.90 by 15s. Each Argonaut chassis is shipped to Italy to be fitted with hand-crafted aluminum bodies by Touring or Bertone. So many options and extras are possible – swivel seats, TV, running water, air conditioning, bar, refrigerator and a compact office – that each car must be made to order. Waiting time: seven to nine months. So much car for so much money. And while they did build the chassis and drivetrain – just one – as evidenced by the photos in the above, the body was never made – at least in Italy. 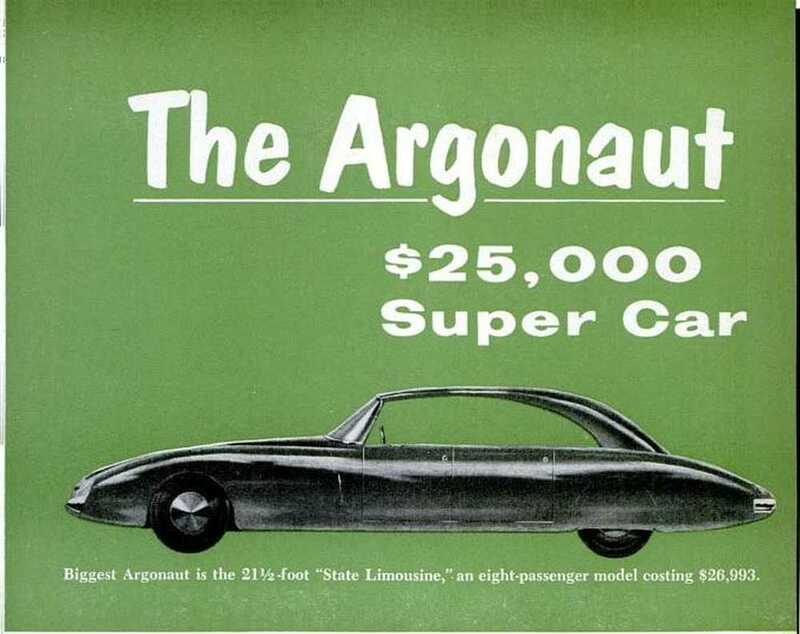 More about that in a future article about the Argonaut. Did not even know this existed. What a brilliant looking product and name to boot (smoke!). Thanks for sharing. A little more knowledgeable than before and looking forward to reading more about this unique car. Am curious to see what happened and where it is now. Someone should really finish the project, it deserves to be done. Believe it or not, this car got even to the pages of an old period Soviet car magazine! If I still do have a proof, I will try to find it for you all! Wow! a 5 inch diameter frame , .187 thick, you could put a train body on that frame! I love the Hemi with duel quads, the chrome, stainless, and the ceramic coating. The body screams look at me! I’m fast, rich and beautiful. When I look at this car I think “I’m going to need a bigger garage”. I’ve got my check book out, where can I get a smoke for 25k? Beautiful car and concept, a Hemi too! Thanks for the research, will be watching for more! 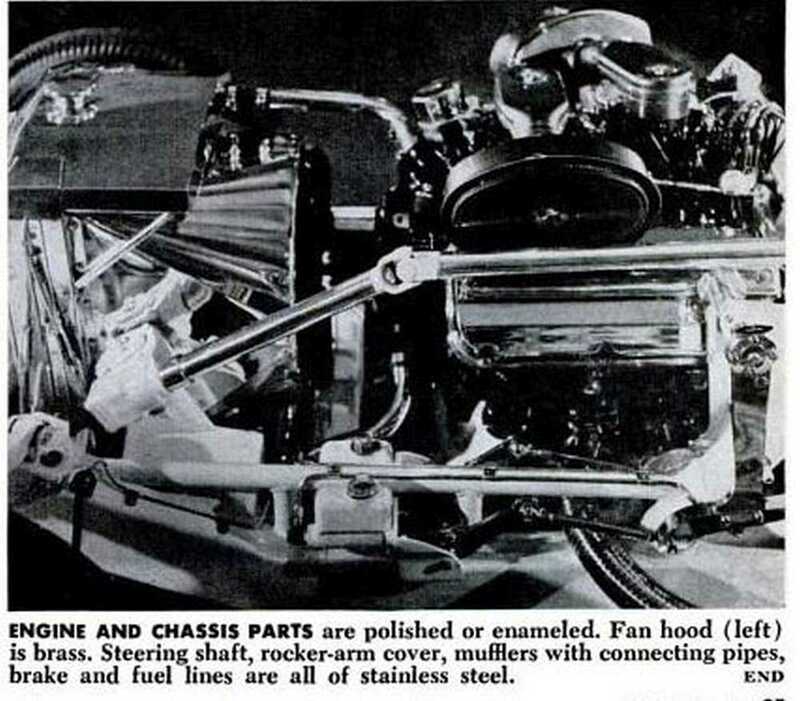 On the possibility that it will help some historian date the build process of this chassis, in the B&W photo of the Hemi, the “sidemount” air cleaner assemblies on the dual quads are the earliest production (of three types) used for the 1957 Chrysler 300C models, having a plain face stamped where they enter the tube to the carb. This type was found to create a bothersome resonance, was revised and revised again for the rest of the years production. 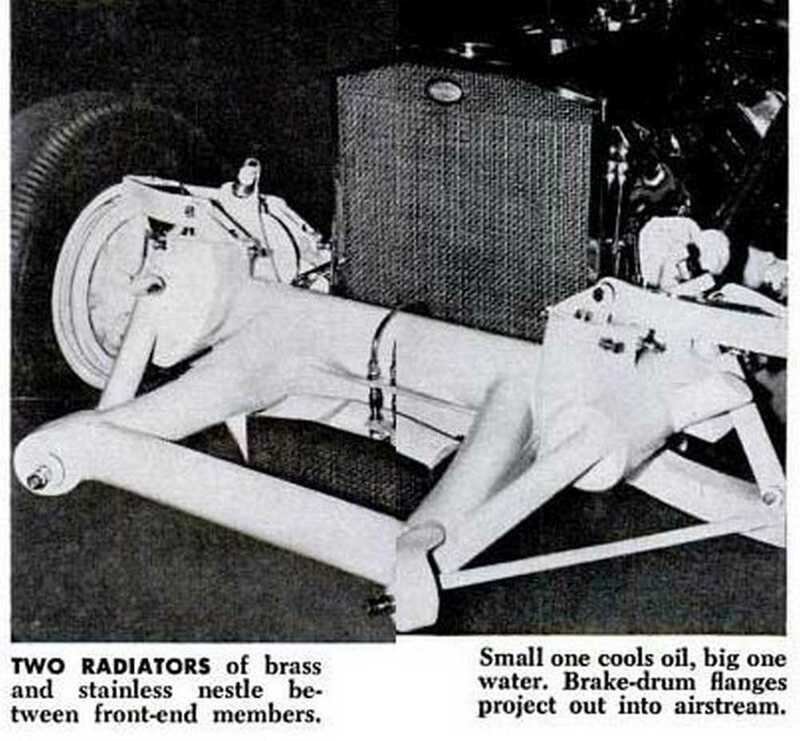 If the engine by its serial number, and perhaps the torsion bar assemblies, were sourced from a first quarter of 1957 300C, it may aid in understanding the car. Hi Geoff . 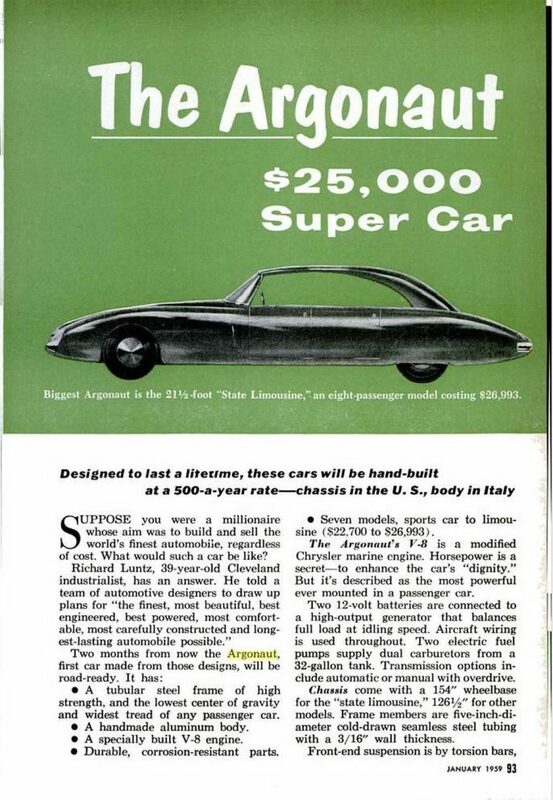 . . Have you learned any more information concerning the ‘ARGONAUT for sale’ advertisement that I included in my initial information that you received from me, soon after you asked me to send you info. re. Harry Heim ? the chassis; he commented briefly about his travel to Ohio to confer regarding THIS vehicle. This is what I recall about what Heim shared with me when I was a sophomore at Penn State, on a weekend that I returned to Clearfield, PA.
Our mutual friend (also from Clearfield) Bill Jackson, co-authored . . . ROLLING SCULPTURE a designer and his work . . .
with Gordon Buehrig . . .